"CHANGES AT MIORTUK IN THE NORTHERN FOREST!" This week, there were a few big changes taking place here at Miortuk. First, Denis Tremblay (a friend & fellow musher) instaled a new septic system here.This was a big job and it turned out great. 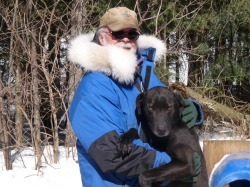 Denis is also starting prepatation to compete in the 1000 mile Yukon Quest Sled Dog Race. If you would like to follow Denis on his adventure, please go to my " links" section to visit his web site at Chenil Makamic. After completing the septic installation, we completely reworked the kennel to give it a fresh new look. The dogs are really enjoying their new digs! At this time of year, thoughts go to planning for the upcoming running season. At the same time, I also reflect on dogs and adventures of the past. With that in mind, I have created a new page called "Reflections". Here, I will relate some of the memorable moments in my life with Sled Dogs. I invite you to visit that page and hope you enjoy it.